To meet the demands of today’s increasingly competitive global economy, companies and businesses require a highly skilled and intellectually flexible workforce. Our innovative partnerships with other WSU colleges and other universities provide a wider platform for students to learn on, modeling collaboration and marshaling resources to better prepare students to navigate life and careers in an age of global connectedness and competition. 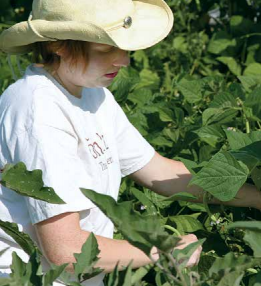 Each major emphasizes gaining a solid background in the agricultural sciences, including learning to work with, and in, the complexity of agriculture and food systems. An internship related to one’s focus area is required. The MPS doctoral program incorporates plant physiology, biochemistry, and molecular biology, and is considered one of the top programs in the world. The interdepartmental curriculum is led by 43 faculty members from the CAHNRS Departments of Crop and Soil Sciences, Entomology, Horticulture, Plant Pathology, and the Institute of Biological Chemistry, as well as in the Departments of Biological Sciences, Chemistry, Molecular Biosciences, Electrical Engineering, and Computer Science. Graduate students study with some of the best minds in America to understand the characteristics and mechanisms of plants. They use this knowledge to develop life-saving medicines, keep our food safe, and evolve agricultural systems to feed the world.